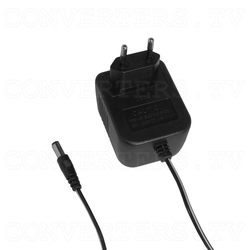 This power supply will convert 240VAC input to 7.5V DC 500mA output - Center Negative - This is a Europlug and is used in Germany, Austria, Switzerland, Italy, the Netherlands, Belgium, France, Spain, Portugal, Denmark, Norway, Sweden, Finland, Greece, Turkey, Israel, Poland, the Czech Republic, Slovakia, Hungary, Rumania, Bulgaria, and Russia. Also used in the Middle East, most of Africa, South America, also many South and South-East Asian countries. This is a Europlug and is used in Germany, Austria, Switzerland, Italy, the Netherlands, Belgium, France, Spain, Portugal, Denmark, Norway, Sweden, Finland, Greece, Turkey, Israel, Poland, the Czech Republic, Slovakia, Hungary, Rumania, Bulgaria, and Russia. Also used in the Middle East, most of Africa, South America, also many South and South-East Asian countries. Suitable only for countries with 220-240VAC power points.